Parent View gives you the chance to give OFSTED your views of our school at any time of the year. 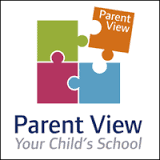 Parent View asks for your opinion on 12 aspects of your child’s school, from the quality of teaching, to dealing with bullying and poor behaviour. Your views are really important in helping inspectors form a judgement about our school, and to help us know what is going well and what could be improved. A screencast demonstrating how to register and complete a survey on Parent View is available on the resource links below. You will also be able to see what other parents have said about Cheddar Grove Primary school. Please click here for the School's Parent View results (no results will be shown until there is over 10 completed questionnaires) or visit https://parentview.ofsted.gov.uk to register. If you do not have a computer or an email address, or if you would like help to use Parent View, please get in touch with us. Parent View information poster: Click here.